Display Software? How Do I Sell That? With each major evolution in software and digital technology, a piece of hardware has disappeared from the AV integration landscape. Next on the endangered technology list is probably the video switcher and hardware inputs in boardrooms, meeting rooms, classrooms, and any other space where collaborative participants want to share and interact with data from their personal mobile devices on a large display in a group setting. SCN's April 2014 Future Trends Survey identified "mobile device integration" as the top demand across commercial AV customer sets today. 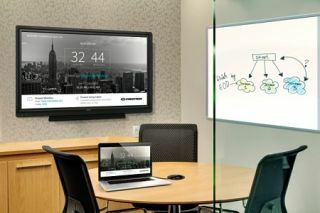 In addition to unified communications demands, there is a larger need for easy connection to an AV presentation system, and communicating in real-time with data and images in a meaningful way. Are your clients still "shoulder surfing" in meetings? Whether million-dollar decisions are at stake, lives and security hang in the balance, or collaboration is key to an optimal outcome, in order for AV consultants and integrators to stay in the game even as hardware fades away, we really have to make it easier to make information from mobile devices visually accessible in a group setting. At InfoComm 2014, there will be myriad new ways to simplify the connection between customers and their mobile device data. Among the most notable of these will be Mersive, which this year will be making a big splash at the entrance to the show floor. Mersive's Solstice software is proven and tested in the field, and the launch of a new version adds to its features and capabilities. But how does it really work in the AV setting. Find out in a webinar designed for AV integration professionals. In this session, Mersive executives will provide their high-level vision of how software is changing the game, Solstice's new technical and functional options, and insights into how the AV sales approach will change, but display software sales still offer plenty of upside for AV designers and integrators. Then an integrator and end-user will reveal how Solstice works in the field. Collaboration is here to stay. Don't disappear with the hardware. Mersive CEOBalgley has worked as CEO of several category-defining companies funded by some of the most successful venture capital firms in the world. Most recently, he was CEO of SkyeTek, the worldwide market share leader in embedded RFID readers and technology. Prior to that, Balgley was CEO of Jabber, the pioneer and leader in enterprise instant messaging, which was later acquired by Cisco Systems. Before Jabber, he was CEO of Mobile Logic, an early market leader of mobile data networking software. Earlier in his career, Balgley held executive positions in sales and marketing at GE, 3Com, Hughes Aircraft and Case Communications. Mersive founder & CTOIn 2006, Jaynes co-founded Mersive and now serves as the company’s Chief Technology Officer. He received his doctoral degree at the University of Massachusetts, Amherst where he worked on camera calibration and aerial image interpretation technologies that were then used by the federal government. Jaynes received his Bachelor of Science degree with honors from the School of Computer Science at the University of Utah. Prior to his work at Mersive, Jaynes founded the Metaverse Lab dedicated to addressing problems in multimedia technologies and research related to video surveillance, human-computer interaction and display technologies. It was recognized as one of the leading laboratories for computer vision and interactive media and has contributed to self-calibrating displays, video tracking and surveillance, illumination models and projective geometry. In 2000, he helped found the University of Kentucky Center for Visualization and Virtual Environments where he studied problems related to virtual reality and novel display systems. IT Technical Director of the Public Technology group, Wharton ComputingMarko Jarymovych is the IT Technical Director of the Public Technology group in Wharton Computing. With over 12 years of service, his primary role is deploying classroom technology and instructional services for the Philadelphia and San Francisco campus’ of the Wharton School. Marko is involved in strategic planning, system design, and execution of technology related projects. Born and raised in Philadelphia, Marko earned a MLA from the University of Pennsylvania in 1999, a MSIS from Drexel University in 2002 and is currently working on technology requirements and design for the Penn Wharton China Center, cloud based/wireless video conferencing/collaboration, and enhancing project management best practices.